These hand painted, something blue butterfly cake decorations are a wonderful way to add a vibrant splash of color to your cake. 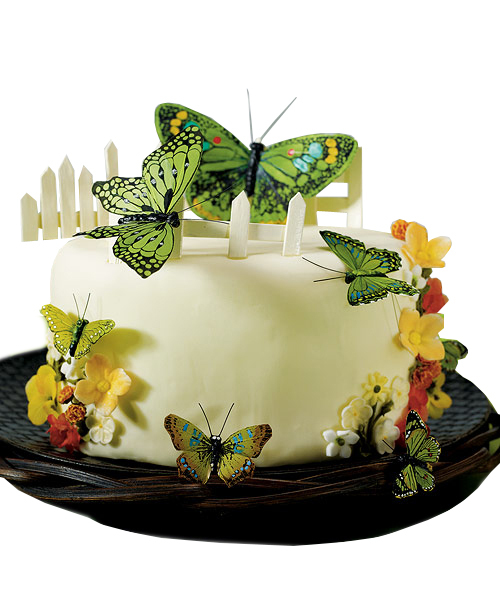 The beauty of the mixed multitude of fluttering wings will create a sense of kinetic energy of movement and life that will enhance the decorative beauty of the dessert. This will make it look as if the flying flock is about to whimsically lift the cake into the air and bear it directly to the waiting guests. The collection of butterflies consists of a mixture of variably hued creatures, with a range of light and dark blue tones intermixed to create an attractive visual display. They also vary in size, simulating the fluttering flight of a real flock of these delightful creatures. Some of them even have sparkling crystals to catch and reflect the light around them, making the display exquisitely decorative. Each of the tiny feather butterflies is hand painted, making them all a unique expression of hand touched art. They measure approximately 2"-4" in diameter and they are sold in packages of 24 pieces, giving you plenty of fluttering friends for any sized cake decoration. 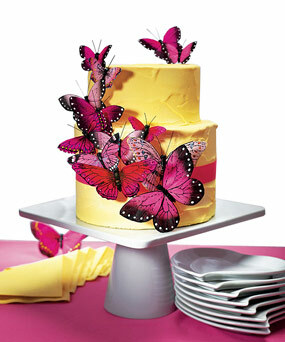 While these butterflies are perfect for a wedding reception cake, they can really be used in almost any application and are fully reusable if you care for them each time. They are perfect for a birthday, sweet sixteen, or even just a garden party where you want to impress your friends with your clever decorations.